What will you feel in Miyajima? Is this mysterious atmosphere? Beautiful nature? or People's and animal's vitality・・？ Only the future will tell. You can see Miyajima Island and shrine by our roof top. We are located in near Miyajima-guchi. (not on Miyajima island), 1 min to street-car station. And also when you go to Miyajima it’s easy to go, so ferry terminal is very close, too. Easy access to A-bomb Dome. You can take local train for 50 min to Down Town Hiroshioma. You can see sunset with Shrine and right up of Itsukushima temple. Our recommendation is to visit Miyajima Island in the morning why it is not crowded. This plan, You can see Low tide and High tide!! It was a very delightful experience. It is located 4 mins by foot from Miyajimaguchi station and to the ferry going to Miyajima island. The staff are super friendly and great cookers. I had the best vegan curry for dinner. They were very generous in filling up your plate until you are extremely full ^_^! The place was super clean. A great stay! Fantastic hostel to stay at for visiting Miyajima island! Would highly recommend it over coming for a day trip from Hiroshima. The staff here are very friendly and there is a great social atmosphere here. The drinks are the cheapest I've ever seen! 100yen per shot! The beds are very comfortable and the hostel is spacious and clean. Great location for Miyajima and the staff was really nice. 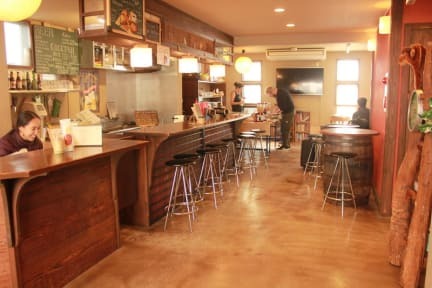 This hostel has a great location for visiting Miyajima island! 2 min walk to the ferry, market and restaurants nearby. The staff are very nice and helpful with all the information you need there, and great people to hang out with! The atmosphere is very good! They got a kitchen if you want to cook, and a convenient bar for drinks with good prices. Would totally recommend! Amazing location for Miyajima! Catch the ferry across the road and you'll be there in no time. Wouldn't recommend it for Hiroshima. Not much of a social vibe but maybe that was just the night I was there. Great staff and facilities. Location is almost next to the port for miyajima island and a 5 min walk from the train station. The staff were very helpful and nice. Free bike hire was really good and an onsen nearby too. Was easy to find and just down the street from Miyajimaguchi station. The atmosphere was very relaxed, and lounge area was nice, but it is a bit small if you’re looking to socialize in a big group. Breakfast was 500 yen—a bit expensive just for the basics. But the beds and bathrooms were clean, and the girls who ran the hostel were friendly. Cozy place for a short trip!